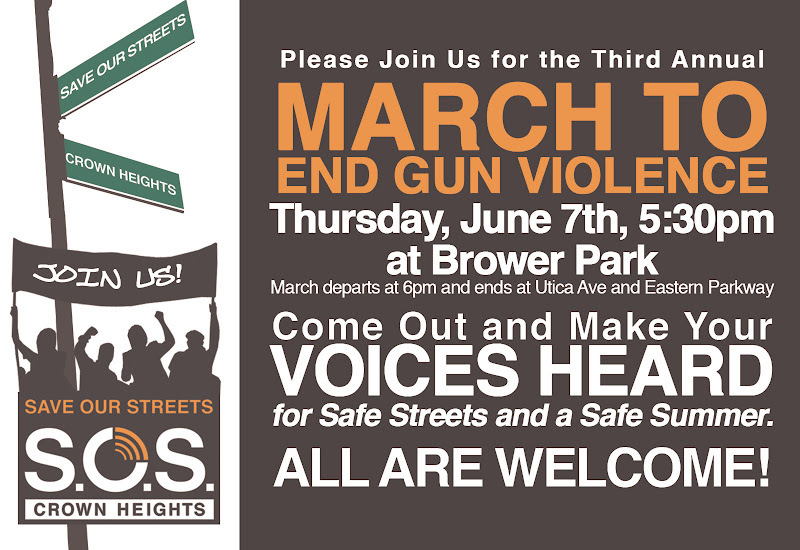 We need your help to end gun violence in Crown Heights. 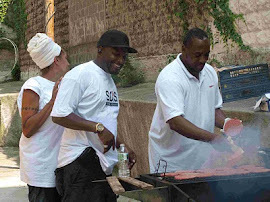 Please join Save Our Streets Crown Heights (S.O.S.) 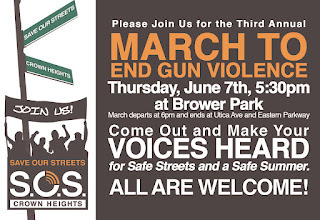 for our annual March to End Gun Violence on Thursday, June 7th, convening at Brower Park at Kingston Avenue and Park Place at 5:30 PM and departing at 6 PM. 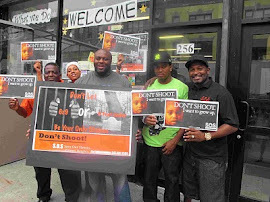 The March will be an opportunity to celebrate the reduction in shootings in the S.O.S. target area in the past two years, from 23 incidents in 2010 to only 12 in 2011, and an opportunity to commit to taking action to make our streets safer. Before the march, S.O.S. 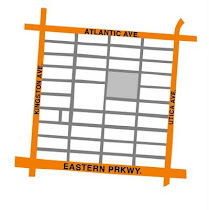 will host a block party from 12:00 – 4:00 PM on Park Place. 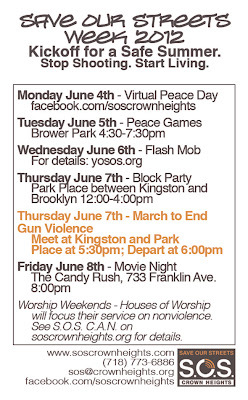 The March to End Gun Violence is part of Save Our Streets Week, June 2nd - June 10th, a week of events to celebrate our accomplishments, identify the costs of gun violence in our neighborhood, and discuss the next steps in reducing violence in the neighborhood. Religious leaders throughout Crown Heights will commence and close the S.O.S. Week of Peace with “Worship Weekends” June 2-3 and June 9-10 by dedicating their religious services to nonviolence messages. 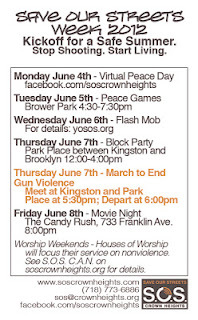 Monday, June 4th will be “Virtual Peace Day” when we spread our message online, and on Tuesday, June 5th we will have our first Peace Games, a day of games for people of all ages in Brower Park, 4:30-7:00 PM. We will also screen Chisholm ’72: Unbought and Unbossed at The Candy Rush at 733 Franklin Avenue, on Friday, June 8th at 8:00 PM. Please see the complete schedule below. Please see more details on our blog. S.O.S. needs volunteers to run this week of events. If you can volunteer at any time during the week of June 2nd - June 11th, please email Eliana at ehorn@crownheights.org.